The short story is AAPL has pulled back, as has the overall market, from the all-time closing high on Friday, June 18 of $274.07 to close at $259.62 this week or +$12.68. Current Apple News & Fundamentals are discussed here. Below is a technical review of AAPL stock. The long story is AAPL is up +5.13% for the week, up +3.22% for the month, up +23.20% for the year, and up an amazing +212.38% since the March 9, 2009 market bottom. This equates to +$12.68 for the week, +$8.09 for the month, +$48.89 for the year, and an incredible +$176.51 since the March 9, 2009 market bottom! AAPL at the July 9 close of $259.62 is -5.27% and -$14.45 from the all-time closing high of $274.07 on June 25. By comparison, the overall market, the S&P 500, is up +5.42% for the week, up +4.58% for the month, down -3.33% for the year, up +59.34% since the March 9, 2009 market bottom, and down -11.45% from the 2010 YTD high on April 23. AAPL is outperforming the overall market. A review and weekly update of Apple Inc. news and fundamental analysis is in the previous post. A review and weekly update of USA and World market and economic news and fundamental analysis is here. Sentiment is "cautiously optimistic" about the global recovery. Asia-Pacific is the most robust economic region while there is uncertainty about Europe's sovereign debt, financial system, and economic recovery. USA leading economic indicators are signalling the recovery is slowing down, perhaps even stalling. USA unemployment and underemployment remains high, bank lending continues to contract, housing starts have plunged, durable goods orders are down, and the Q1 GDP was unexpectedly revised downwards. Yet USA manufacturing shows some surprising strength and sustainability. The intermediate-term signal, the comparison of the 25 day and 50 day simple moving averages, generated a buy/long/bull signal on Wednesday, June 23. A bear signal had been in effect since June 10. AAPL previously had been in a bull market since March 12, 2010. Currently the 25d sma is remains higher than the 50d sma. The next noteworthy prices are the May 12 closing peak of 262.09 and June 2 peak of 263.95. Surpassing these two prices clearly places AAPL up near the lofty all-time highs. Then the key resistance and benchmark prices above are the earlier 2010 YTD and all-time high on April 23 of 270.83 and the new all-time high on June 18 of 274.07. The minor peak of 258.66 on July 7 could possibly provide technical support as could the minor peak on May 17 of 254.22. The April 15 peak of 248.92 and the latest pullback trough of 246.94 on July 2 are also support. AAPL is above all of the simple moving averages noted on the chart: 25d, 50d, 100d and 200d. AAPL did drop below the 25d sma during this latest pullback but regained it on July 9. The 25d sma is just above the 50d sma. The 25d sma is descending and the 50d sma has leveled off. The 100d and 200d sma's continue to ascend. This recent short, higher, yellow uptrend line, a rate of price ascent, illustrates that AAPL has been putting in higher lows during recent pullbacks. The uptrend line is from the May 7 dip and closing low of 235.86 up to the May 20 dip and closing low of 237.76. The later dips and closing lows of 243.20 and 246.94 on June 9 and July 2, respectively, have been higher lows. This is a bullish and encouraging indicator for AAPL. The long, lower, yellow uptrend line, a rate of price ascent, is from the AAPL January 20, 2009 closing low of 78.20 up through the February 4, 2010 closing low of 192.05. The February 4 closing low has been the bottom for 2010. AAPL spiked decisively above this uptrend line on February 24. AAPL has now stayed well above henceforth (except for a downward intraday pin on Flash Crash Thursday, May 6, 2010). A downtrend line, a rate of price descent, has been created by the pullback from the June 18 all-time high. This downtrend line is from the June 18 all-time closing high of 274.07 down through the June 22 sub-peak of 273.85. AAPL has stayed below since. The RSIs allow for plenty of upside room. The MACD remains bearish since June 29 but is uptrending at -1.04. The 2010 peak was +2.49 on March 10 and 2010 low was -3.55 on May 7. Previously the highest was on November 4, 2008 at +3.41. The 10 month exponential moving average of 227.10 is a long-term trend indicator and shown on the monthly chart below. That is the line in the sand, so to speak, for the long term signal of a bear market. 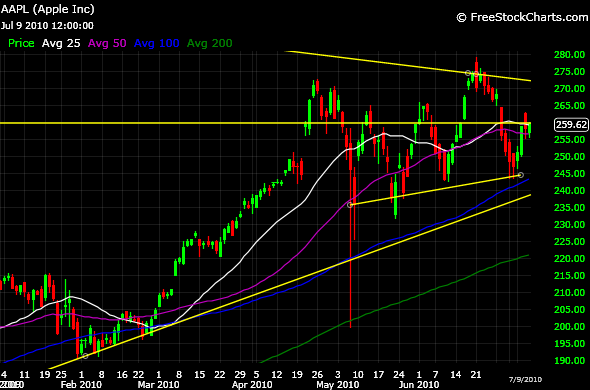 AAPL is well above this signal at the current close. AAPL is in a long-term bull market and has been since April 2009. Through recent disappointing USA economic data, the overall market pullback, uncertainty over the USA economic recovery, the Flash Crash, and the EU & Euro Crisis, the fundamentals at Apple Inc. have never changed. The fundamentals of Apple are actually improving and are reviewed in the previous post. Apple Inc. is doing great! Apple has been charging ahead with the introduction of the iPad, iPad 3G, a iPhone 4, iOS 4, and a new mobile advertising platform (iAd). iPhone sales and market share are impressive and now there are reports of very strong iPad demand. "Apple is beginning the strongest product cycle in the company's history, led by the iPad and iPhone 4", stated Deutsch Bank on June 22. The current price has not caught up with AAPL fundamentals. The RSI 14 day and 28 day allow plenty of upsdie. The MACD is bearish but uptrending. The intermediate-term price trend is tenuously bullish. The long-term price trend remains bullish. 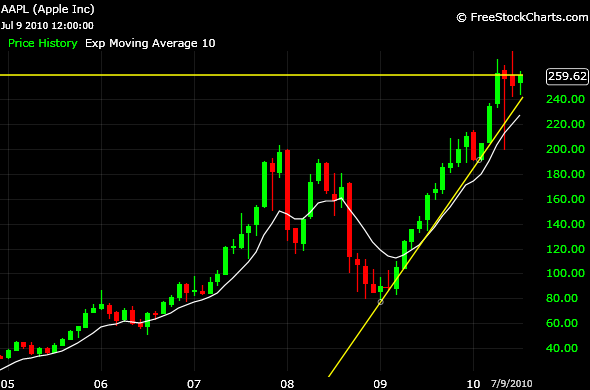 Below is the monthly AAPL chart since January 2005. The overall analysis and commentary is the same as for the daily chart above. The yellow horizontal line, the current price, and the yellow uptrend line are the same, and as described, on the daily chart above. The white moving average line is the 10 month exponential moving average, which is the long-term bull or bear market signal, as discussed above with the daily chart. Follow AppleReporter (Apple Digest) On Twitter!